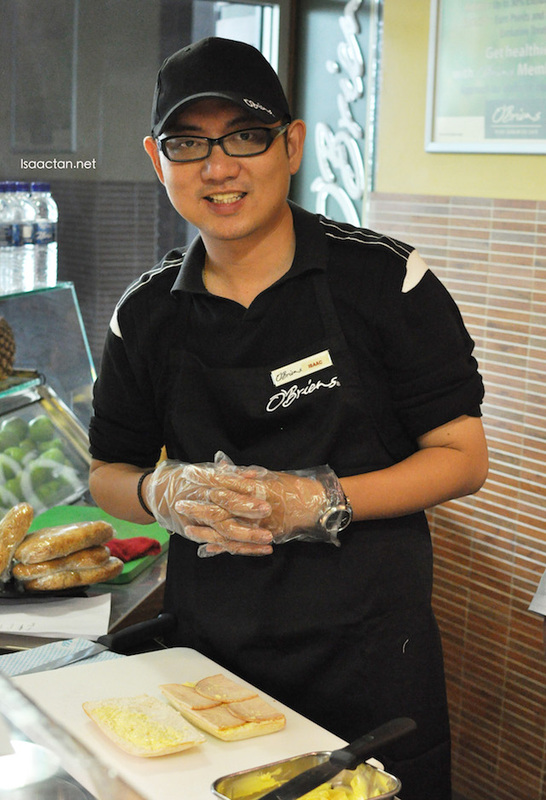 It was a morning of fun, where together with fellow Seeties foodies and bloggers, we gathered at O'Briens Irish Sandwich Cafe in Publika Shopping Gallery to make some sandwiches. 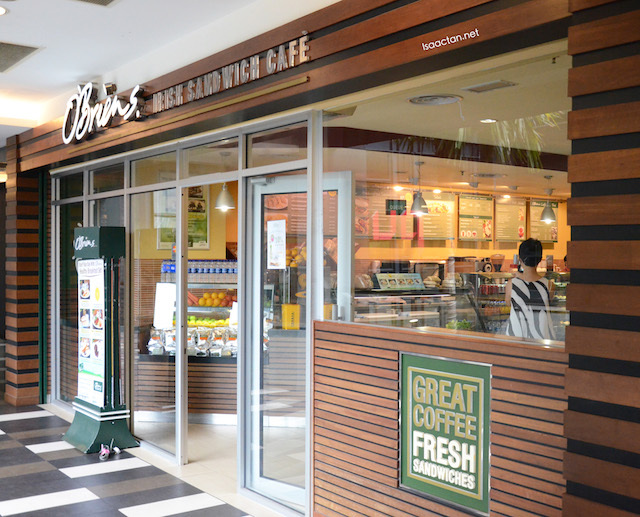 O'Briens Irish Sandwich Cafe is a lifestyle chain cafe founded in 1988 by Brody Sweeny in Dublin, Ireland and has since expanded to over 200 stores worldwide. Arriving at the outlet early in the morning, we were warmly greeted by the folks from O'Briens who after a quick welcoming speech proceed to introduce the brand and what they have to offer. It was a sandwich making workshop event, hence we were all given an apron, cap, and our very own personalized O'Briens nametag. Let me serve you your sandwich today sir. 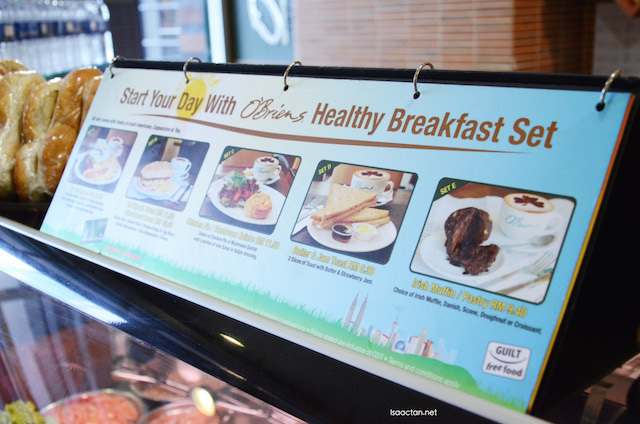 With 21 outlets in Malasia, O'Briens is easily accessible to anyone who craves for a healthy wholesome meal. 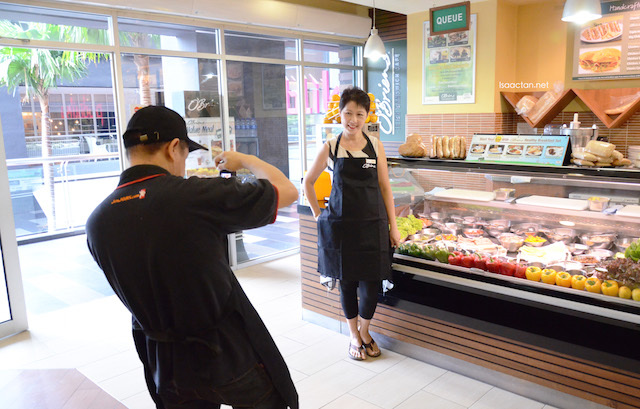 They are well known for their fresh made-to-order hand-cut sandwiches, salads, wrappos, soups, freshly squeezed juices, refreshing smoothies, gourmet coffees, cakes, Irish snacks and much more. Don't take my word for it, but O'Briens uses one of the best premium ingredients that I've seen in a while. So what makes O'Briens different, or rather, unique as compared to other cafes. Well, for starters, you get to enjoy a cup of coffee or their delectable sandwiches in a comfortable, relaxing environment decked out in the latest trend and design from Ireland. O'Briens' breads are baked with a specially formulated Irish recipe. Unique to O'Briens, they have the Shambo which is a type of foccacia bread baked in the shape of the Shamrock. (The Shamrock is the epitome of Ireland and represents good luck thus it is closely associated to O'Briens. O'Briens sandwiches are prepared using premium ingredients such as chunky tuna in brine, smoked chicken slice and top notch quality beef. I was told they do not compromise in using less than awesome ingredients as the folks from O'Briens believe in giving the freshest and finest to their customers. I'm impressed with the ingredients, which I happily chose for my 'all-meat', less vegetables, more cheese sandwich. There are as many as 15 types of main fillings store in this eye-catching sandwich bar that specially imported from Spain, such as the Egg, Egg Mayo, Plain Chicken, Chicken Mayo, Chicken Slice, Chicken Crisp, Chicken Sausage, Mild Spicy Herbs Chicken, Volcanic Chicken, Peri-Peri Chicken to Turkey, Beef, Plain Tuna, Tuna Mayo and Smoked Salmon too. Now making sandwiches aren't as easy as it looks, so never take for granted how the staff whips up your noms almost effortlessly. It took a lot of concentration and focus on my side, as I proceed to make my very own meaty sandwich. A quick layer of butter was spread onto the bread, before it is being oven toasted for less than a minute. Coming out crispy, and very fragrant, I proceed to slap on the turkey meat slices, cheese, and some onions. Thumbs up to my own self-made sandwich. It's a good thing no one else dares to have my sandwich after I made it. I get to have it all for myself then! Creating your own sandwich is very easy at O’Briens Irish Sandwich Cafe, you just need to follow the given instruction of 1 Bread + 1 Main Filling + 3 Salads + 1 Sauce in order to have a good layering wholesome sandwich. The spread and sauces in O’Briens are created using special Irish recipe that only available at O’Briens. With Basil Pesto, Cream Cheese, Honey Mustard, Aran Island, Ballymaloe, Caesar Dressing, Italian, Cranberry, Guacamole (made from fresh avocado) and Houmous, we were indeed spoilt for choice. 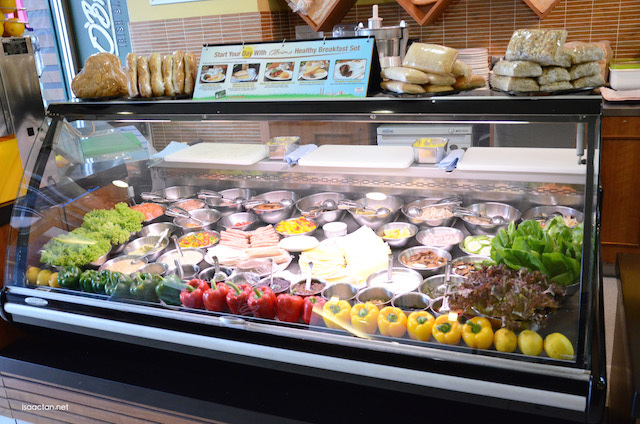 Besides the signature freshly made-to-order hand-cut sandwiches, O’Briens Irish Sandwich Cafe is also known for their salads, wrappos, soups, freshly squeezed juices, refreshing smoothies, gourmet coffees, cakes, Irish snacks and outside catering platters. To have the healthy Irish sandwich in town delivered straight to your doorstep, just call 1-300-30-3000 now or check out their website at www.obriens.com.my. I went to their Mid Valley outlet and I loved it!!! 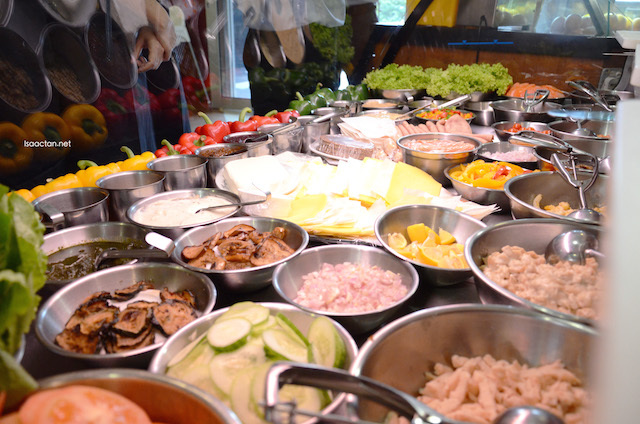 good to have fresh ingredients to put in sandwich. Haven't check out this outlet, shall do soon. Sandwiches are now fancier than just a plain egg or chicken sandwich. Amazing how we can actually have a wholesome meal in a sandwich. but only 1 sauce? They all sound so nice I want to try more than 1 leh LOL Can I have half-half on my bread? This is very interesting workshop.. My kids love subway sanwiches! It's yummy!